Home » Our Body » Why do we Blink our Eyes ? Why do we Blink our Eyes ? Human eyes are extraordinary device that provides most of the external information to our brain, which helps us in identifying objects, faces, moods, danger and a lot of other things. A person with good eyes can't even imagine the life of a blind person. Yet we don't care much about them. We don't even tend to know the basic functions and how our body protects this beautiful yet brilliant organ fitted next to our brain. Blinking eyes seems to be a normal thing to most of us, but very less people know why our eyes blink and why do they blink together. While researching on this question, i came across some similar questions. Answers to those questions are worth reading. I can promise you won't regret reading this article about blinking of our eyes. 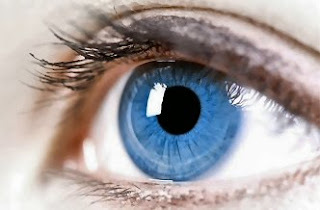 Our eyes need constant moisture and cleaning of the surface. When we blink, one drop of some liquid (mixture of oils and mucous) from our tear glands comes on to our eyes and our eyelid wipes the whole surface of eye. It cleans the surface and moisture is also provided to our eyes. Further the remaining liquid goes out through a duct connecting our eyes with our nostrils. This remaining liquid also provides moisture to our nose, which helps in trapping the dust particles in incoming breathe. Why do we blink both eyes at the same time ? Blinking both eyes at the exactly same time makes us blind for a fraction of second. There must be a reason behind that, else during the evolution process we should have adopted the process of blinking one eye at a time. All animals blink both eyes at the same time, so do humans. The answer to this riddle lies in the structure of our skull and nervous system. Human beings evolved as predators, not like preys. Predators have their eyes close to each other to look in the same direction and focus on objects. Closeness of our eyes made our nervous system use a single nerve to carry the signal of blinking to both the eyes. It made them blink together. That nerve controls our upper eyelid only, which makes blinking easier and less effortless. When we wink a single eye, we use other facial muscles from lower eyelid, cheek and nose, which makes us do more effort and using different nerves. Being a predator our eyes also need to focus on objects. Single eye can see objects, but can't focus on them properly. Two eye in the same direction, working at the same time with full coordination are necessary to focus properly and judging the distance. This might be one of the major reasons that we blink both eyes together. Blink one eye at a time can mislead us in focusing and judging the distance. Why do we blink/close eyes while sneezing ? It is a natural response by our body. When we sneeze the air travels out of our mouth at a speed of 100 miles/hour. This is an enormous speed. When we sneeze the muscles of our face contract to handle the upcoming pressure. This involuntary contraction of muscles closes our eyes as well. This closing of eyes not only provides proper support to our eyes to handle this pressure but also protects our eyes from the germs that my come into our eyes due to high speed air flow. Apart from this regular blinking, our eyes can also blink automatically when they find some foreign material going inside our eyes, such as dust or a fly. This is one of the most spontaneous and fast reactions of our body. It is a protective mechanism of our eyes. Eyes are closest to our brain for a reason, i.e. so that we can protect both brain and eyes at the same time with our hands. Humans blink 15 to 20 times per minute. On an average we take 0.1 to 0.4 seconds to blink. Babies blink quiet less than an adult human being. You will definitely blink while sneezing. We blink more while talking. We blink less while reading.